Let me start with an uncomfortable truth: if you hate Brussels sprouts, you have never had them well-cooked. Or maybe you really hate them, like some people hate coriander, but overboiling them until they lose all traces of texture isn’t doing them any favours. So please, give Brussels sprouts a chance. Blanch them and sautee them with olive oil, garlic and some chilli flakes. Roast them in maple syrup or honey. Or, you know, serve them with beurre blanc and roe. This is also a post about one of my biggest food crushes: Nadine Levy Redzepi. I love her Instagram account: the pictures are not overly-styled flat lays with the contents of an entire woodland on a crisp tablecloth. They are candid and simple, just hinting at the life behind the lens. Her icy blond hair in a bun, bobbing along while she rides to the local butcher to buy underappreciated cuts of meat which she will lovingly simmer for hours in her beautiful Danish kitchen; her equally blond children chopping vegetables on the long table; communal cooking, flatbreads stuck to the sides of the oversized stone oven. Outside, a gloomy, dark Danish winter; inside, all warmth and freshly baked all-butter cookies and praline spread on bread. Nadine cooks with abandon and generosity, and a healthy dose of eccentricity. She makes eggs, like everyone else, but then hides them under such an abundance of truffle shavings that you can just about guess the shape of the bright yellow omelette beneath them. She bathes pork chops (not just pork, perflectly marmbled iberico chops) in copious amount of melted butter. Even the simple stuff is elevated: roast chicken has skin impossibly crispy and shiny, which you could imagine shattering in shards of lacquered crackling. To chicken broth she adds tomato water and infuses the mixture with chamomile tea. As the wife of one of the world’s most respected chefs, Nadine’s sense of flavour is clever, complex, cheffy. When she makes chicken schnitzel, she saves the crackling to have with rice for breakfast the morning after; she sticks a salt-and-sugar cured egg yolk in the middle of a macaron, as a substitute for jam. She is deeply relatable but exquisitely extravagant; part who you are and part who you would like to be. She is me, but an overly-curated, larger-than-life version of me. But what I love most about the way Nadine cooks is that as an outsider, she seems to have such a relaxed, unapologetically uncomplicated relationship with food. She eats what she loves. She makes what she eats a pleasurable experience. Our relationship with food as a society is so fraught, entangled with notions of nutrition and fear of the obesity epidemic and image issues. It’s hard to look at food and not think of it as a sum of macronutrients. We overanalyse food, apply maths to eating, count grams of protein and fibre, create sets of rules. I believe I have a good relationship with food; still, I can’t remember the last time I looked as a meal as just that – a meal, rather than a series of consequences. I was probably a child. I’m making assumptions, of course, but I feel like Nadine doesn’t worry about whether she should have a salad for her next meal after devouring a plate of golden breaded fish. The language she uses around food is free of free from-isms; she doesn’t shout about nutritional value or vitamin contents. She is not afraid of butter. I ordered her book before it even came out. It was everything I imagined and nothing I imagined. Behind an apparent, off-handed simplicity, her dishes are cheffy and complex. She cures yolks like there is no tomorrow: she scolds them briefly in hot water, cures them in soy sauce or salt, places them on fluffy clouds of mash. A cured egg to Nadine is like grated cheese is to you and me. And so it should be. Quite a few recipes at the beginning of the book are of crisps with dips, and you look at them and think, easy enough. Except no, her crisps and hand-cut and hand-fried; her dip contains caviar. 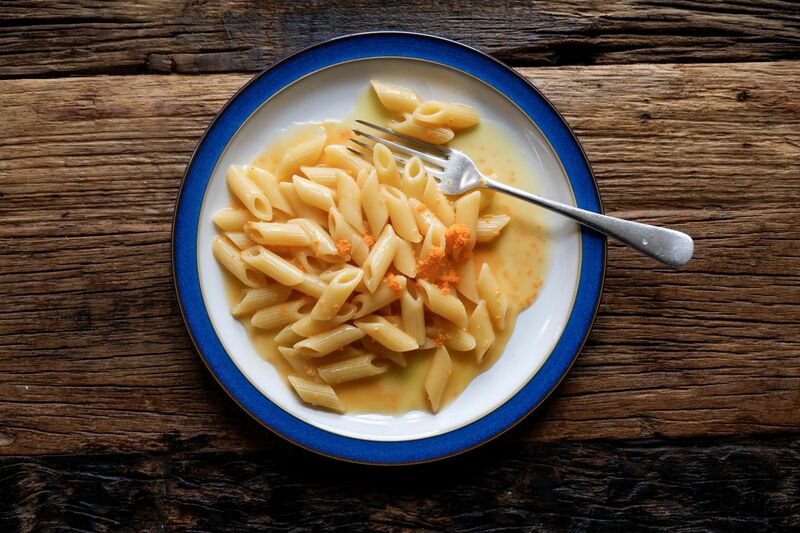 A plate of simple pasta, in which I can discern some tomato and strips of basil, turns out to actually be resting atop a pool of beurre blanc. Bread is fried in butter. Because again, she is not afraid of butter. This recipe is also for those who are not afraid of butter. 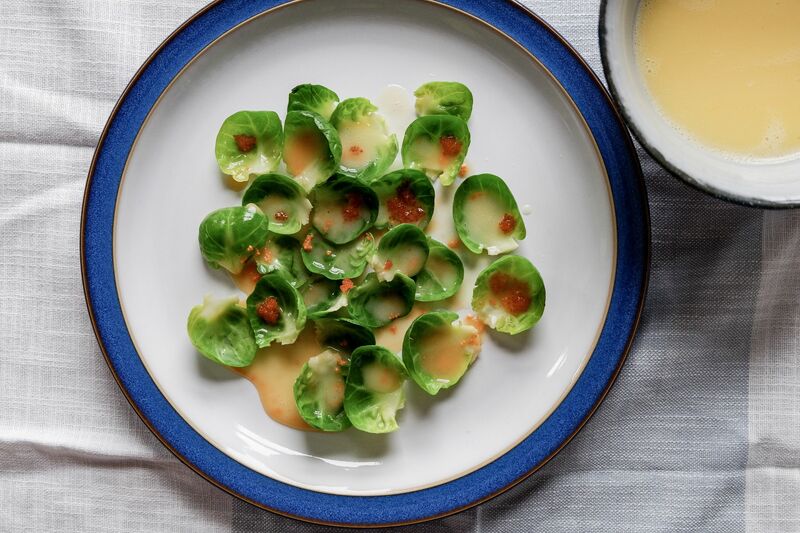 It’s adapted from her “Brussels sprouts and potato cups with beurre blanc sauce and roe” recipe, except the original recipe only features six or seven delicate Brussels sprout leaves, and potato skin cups. Potato skin cups. I was meant to scrub new potatoes, bake them, scoop the flesh out, let them cool and dry, etc. So I just lost the potatoes entirely. I made some small modifications, too: my beurre blanc, which can be made with wine or vermouth (or champagne, says Nadine, because of course) has some lemon juice, which brings a mouth-puckering sharpness to the dish. Deprived of its potato component, this dish is still delicious. It’s a side that’s hearty and light, earthy and bright. You could, really, skip the fish roe, but it’s a great textural addition and brings complexity to the dish. While it’s a little bit of a faff to peel the sprouts, this is a dish that comes together in minutes, works well as a Christmas salad, will impress everyone and will give you a chance to show off your French with that beurre blanc. Peel the outer leaves off the Brussels sprouts, then blanch in boiling water for no longer than 5-10 seconds. Drain and shock them in very cold water. Prepare the beurre blanc: pour your liquid mixture in a pot and let it reduce over medium heat until it’s reduced to about a third of its original volume. Add some salt, then whisk in cubes of butter, a few at a time, without ever stopping. When the butter looks softened but not completely melted, add some more cubes. The result should be a velvety but still liquid sauce. 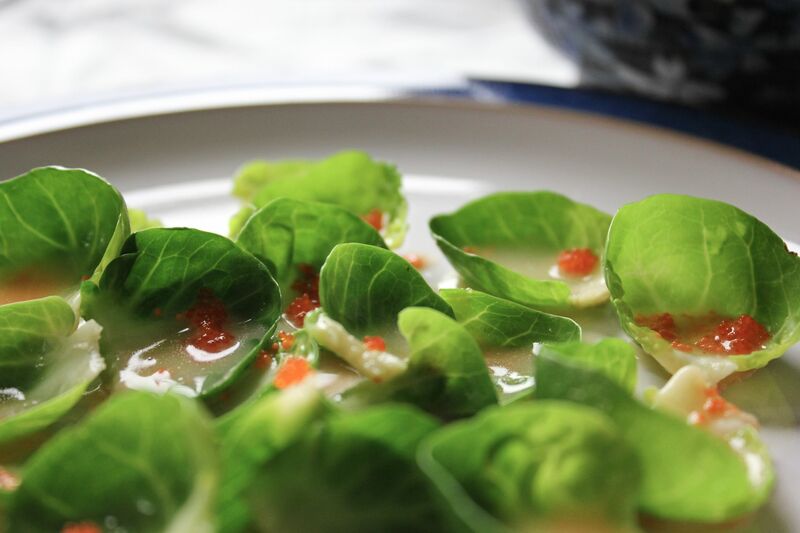 Place your sprouts on a dish, add the roe to the beurre blanc and delicately pour over the sprouts.